One of my projects for 2012 was to collect a postcard from each of the 50 States of America. I am very close to completing this project! I thought I would count down and share what I have received/have from this project. 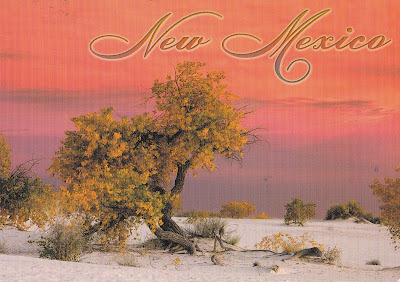 This is my postcard from New Mexico. It was sent through a direct swap on Postcrossing.com. I messaged people that lived in the few states I still need and asked them if they would want a postcard from here in exchange for one from there. Awesome! So this means you just need North Dakota now, huh?